5 Life Lessons from Selling it All & Hitting the Road. 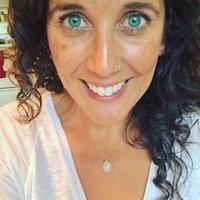 One year ago, my husband and I sold about 95 percent of what we owned to embark on a life of full-time slow-travel with our three-year-old daughter. Being from Texas, we admittedly wanted to escape the heat and the mosquitoes, but it was also about so much more: We were seeking a new kind of freedom in a culture that said it wasn’t possible. Our plan was to split time between the mountains of Colorado and the beaches of Costa Rica for the first year, and then figure it out from there. My husband got permission from his company to work remotely, and the only hitch came when we found out he wasn’t allowed to live internationally. I was mildly disappointed (okay, kind of devastated), but we rallied and set our sights on California knowing we’d find our way to Costa Rica soon enough. It was absolutely exhilarating getting rid of our things. With every big item that went out the front door, I did a little happy dance in my heart and felt my energy getting lighter and lighter. The moments of fear were few and far between, and mostly it felt like this sweet homecoming to a way of being I’d always been headed towards. 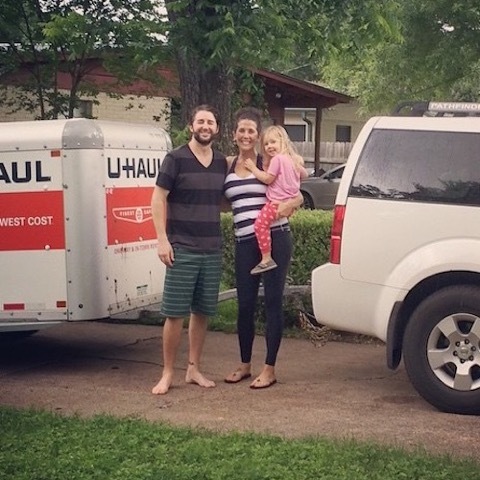 When we left Austin on Memorial Day in 2015, we pulled a small U-Haul trailer filled with about 15 totes full of clothes, toys and sporting equipment. It’s now been almost an entire year, and I’ve been reflecting on the wisdom we’ve gained and the memories we’ve made. Our situation may be unique, but the lessons we’ve learned have been universal. Of all the places we’ve stopped along the way, the ones where we embedded ourselves in the community and made friends were by far our favorite. We’ve seen gorgeous beaches and hiked beautiful mountains, but without someone to share that with at the end of the day, it fell a little flat. Of course we have the three of us, but we quickly realized how much each of us needed our own support outside of the family unit. Most importantly for us at this stage of life, we found other families with kids the same age as our daughter. This has looked like long term friends she made in our months in the same town in Colorado or a simple playmate for the day at a park in California. And just as much as she has needed the stimulation from other kids, we’ve needed those conversations with other parents to commiserate and share battle stories of parenting. It hasn’t been without effort. Most people would laugh to see the lengths we’ve gone to in the name of making friends. But it’s been so worth it, because no matter the lifestyle choice or the amount of stuff we own, we all need other people rallied around us in love and support. Our plans along this journey have changed at least 107 times…I’m not kidding. And while it’s both necessary and important to have travel logistics ironed out to some extent, we’ve found again and again that this crazy desire to know what comes next is just that—crazy. We laugh looking back at all the time we spent brooding and discussing and hashing and analyzing only to have what comes next happen in an instant. The turns on our journey have been quick and unexpected, and more often than not they haven’t looked at all like what we planned. We approach planning these days with lightness and ease. We look for signs from the Universe to guide us on when it’s time to make a move and what that move should be. We spend a whole lot more time in meditation and contemplation and much less time in anxiety and constriction. It isn’t that we don’t make plans; it’s just that we don’t take them too seriously, and we are always open to them changing. We allow room to be surprised. 3. Less really is more. There has not been one single time in the last year when I’ve stopped and thought, “Man, I really wish I hadn’t gotten rid of that ______.” If anything, I am constantly looking at our stuff and trying to pare it down even more. Each time I pack to move to the next home, I see a visual representation of what is important to us. Our things are so distilled down that it is clear where our priorities lie: The Vitamix I’ve lugged across the country in the name of wellness; the handmade blanket from my meditation trip to Bali; our yoga mats; each of our crystal collections; my favorite Lululemon stretchy pants. We use every single thing we own, and that feels really great. Having less has taught us adaptability and an appreciation for what really matters. My life feels curated and purposeful instead of excessive and overstuffed. And I don’t think a person has to sell it all to feel that way. It can start with decluttering a drawer or cleaning out a closet. It’s simply about being willing to let go in the name of joy. Man, this is a biggie. As much as it would have been nice for this trip to fix everything for me, it hasn’t. It seems that no matter where we are along this journey, there I am too. And along with me have come my pains, my obsessive thoughts, my limiting beliefs, my sorrows and my insecurities. I didn’t see them get all packed up in the U-Haul when we left, but there they’ve been each time we’ve arrived somewhere new. It is way too easy to fall into the “if, then” trap of thinking. If only I lived in the mountains, then I wouldn’t feel so trapped. If only I could jog on the beach every morning, then I wouldn’t feel so depressed. I have “if/thenned” with the best of them, and the truth is that no matter where we are, our problems follow. Being on the road has shown me even more about the importance of cultivating joy from within. The way we see the world is a product of our beliefs, and if we believe that our joy is always at the next stop, we’ll never find it. Joy starts right where you are right in this moment. 5. Your life is about doing what feels right for you. Perhaps the biggest and most important lesson we’ve learned is that life is about seeking that which fulfills us. And that which fulfills us isn’t going to be right for everyone else. Although most of our friends and family were supportive of our decision, there were plenty of fears and opinions directed our way about what we were doing. I think it’s common for people to fear the unknown…and our chosen path was certainly unknown! They were worried about us because they care—and that is understandable. What we have learned again and again is that we are the ones who are living the consequences of our choices, and those choices have worked out pretty great for us. Life is way too short to be burdened by other people’s projections of fear, and if we had allowed their fears to paralyze us, we wouldn’t be living all this beauty right now. We are here to spread love and joy, and it’s our job to get about the business of doing what makes us feel loving and joyful—right here, right now.